In the northernmost portion of the Serrania de Jarara (Alta Guajira, Colombia), low - medium grade metamorphic rocks from the Etpana Metamorphic Suite were thermally affected by emplacement of a small calc-alkaline intrusion (Parashi Stock). Detailed petrographic analysis in collected rock samples across the NE and NW plutonic contacts show occurrences of textural and mineralogical changes in the country rock fabric that evidence contact metamorphism overprinting regional metamorphism of the Etpana Suite. These changes include growth of andalusite (chiastolite), calcic clinopyroxene and amphibole porphyroblast crosscutting Sn+1 metamorphic foliation. Hornblende-plagioclase barometry (ca. 3.1 kbar) and cooling models for the stock show maximum time temperature evolution in the country rock at the interpreted depth of intrusion (ca. 11 km) and help to evaluate the behavior of the country rock with the changing local geotherm. Keywords: Parashi Stock, Etpana Metamorphic Suite, Alta Guajira, thermal models. En el norte de la Serrania de Jarara (Alta Guajira, Colombia), rocas metamórficas de grado bajo - medio asociadas al Conjunto Metamórfico de Etpana fueron térmicamente afectadas por el emplazamiento de una pequeña intrusion calco-alcalina (Stock de Parashi). Un análisis petrográfico de muestras de rocas colectadas a lo largo de los contactos NE y NW del pluton muestran cambios mineralógicos y texturales en la roca caja que evidencia metamorfismo de contacto superpuesto al metamorfismo regional del Conjunto Etpana. Estos cambios incluyen el crecimiento de porfiroblastos de andalucita (quiastolita), clinopiroxeno calcico y de anfíboles cortando la dirección de foliación Sn+1. Cálculos barometricos, usando la asociación hornblenda-plagioclasa (aprox. 3,1 kbar), y modelos de enfriamiento del stock muestran una evolución de las temperaturas maximas en la roca caja a la profundidad de emplazamiento interpretada (ca. 11 km) y ayudan a evaluar el comportamiento de la roca caja con los cambios que ocurrieron en la geoterma local. Palabras clave: Parashi Stock, Conjunto Metamorfico de Etpana, Alta Guajira, modelos térmicos. 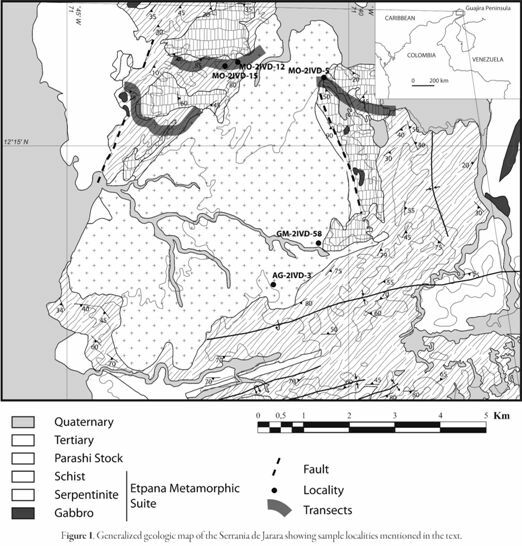 Many of the geologic events that affected northern South America since the late Proterozoic are almost completely recorded in rocks of the region known as Alta Guajira, in Colombia (Zuluaga et al., 2009). Precambrian and Paleozoic collisions are recorded by a granulitic gneiss of Grenvillian age (Cordani et al., 2005, Cardona et al., 2006) and by a Paleozoic gneiss that is related either to the Taconic orogeny or the Alleghenian orogeny (Cardona et al., 2006; Zuluaga et al., 2009). Jurassic continental rifting and development of a passive continental margin and subsequent Cretaceous-Tertiary compressive events have also left traces in the Alta Guajira geologic record (Zuluaga et al., 2009). The present tectonic configuration of the Alta Guajira is mostly due to interactions of the Caribbean, Pacific and South American tectonics plates during late Mesozoic and Cenozoic times ((ames, 2000; Zuluaga et al., 2009). The focus of this paper is to study overprinting contact metamorphism related to a small calc-alkaline intrusion in low to medium grade regional metamorphic rocks and to model the thermal effects of pluton emplacement at depths of less than 12 km. The NW portion of the Serrania de Jarara (Alta Guajira, Colombia) offers a unique opportunity of such study thanks to the well-preserved surface geology of the area and its excellent outcrops. In the Serrania de Jarara, a quartzdioritic Cenozoic pluton intrudes a Late Cretaceous (?) melange with metasedimentary matrix and mafic - ultramafic blocks. Especially, our research addresses the emplacement conditions ofthe pluton in the low - medium grade metamorphic country rock that produced a contact metamorphic aureole around the pluton. Two areas (NW and NE of the Stock) were selected for systematic rock sampling along 2 km sections, starting at the pluton contact. Sampling was accompanied by a detailed structural description including data collection from joints, cleavage, foliation, and folds' axes. Nearly 100 samples were collected, but only 20 representative samples were selected for petrographic analyses in thin section and four samples were selected for microprobe analyses (MO-2IVD-5, MO-2IVD-12, AG-2IVD-3, GM-2IVD-58). The petrographic analyses ofchosen samples consisted in textural description and mineral identification. On one specific sample, with evidence of contact metamorphism, microstructures were described in more detail in order to characterize those linked to contact metamorphism. Microprobe analyses followed petrographic interpretation. Core and rim compositions were determinedfor3amphibolegrainsand3plagioclasegrainsinasamplefromthe pluton (sample GM-2IVD-58). Microprobe analyses were carried out with the JEOL 8600 Probe Microanalizer hosted at the University of Alabama. The quantitative mineral analyses were performed using a probe of 1 Um beam diameter, 20 nA beam current, 15 kV accelerating voltage and counting times of 30 to 45 msec in each peak. Structural formulae for amphibole and plagioclase were calculated following the methodology of Robinson et al. (1982) and amphibole compositional classification followed Leake et al. (1997, 2004). Hb-Pl thermobarometry, to determine emplacement pressure and temperature, followed the methodology of Hammarstrom and Zen (1986) and Hollister et al. (1987) for crystallization pressure (total Al in hornblende) and the Holland and Blundy (1994) hornblende - plagioclase thermometer for crystallization temperature. which overcomes the problems faced when trying to solve analytically the equation. In the above equation K is the thermal diffusivity, t is the time, and T is the temperature. The program allows to quantify heat flow around a magma body and to understand changes in the local geothermal gradient that resulted in contact metamorphism. The model predictions for maximum and minimum temperatures reached in the country rock were used to evaluate microstructures that indicate contact metamorphism overprinting regional metamorphism. The Serrania de Jarara is located in the central portion ofthe Alta Guajira, Colombia (Fig. 1), as a small slightly mountainous northwest-trending elongated area. Lithologically, this zone is characterized by low - medium grade metamorphic rocks (Etpana Metamorphic Suite) and a pluton (Parashi Stock), surrounded by Tertiary sedimentary rocks (Siamana and Uitpa Formations) and Quaternary deposits. The first known works about the geology of the Guajira Peninsula are those of Renz (1959), Bürlg (1960) and Rollins (1960). However, Lookwood (1965) was the first to present a detailed study of the metamorphic rocks and the intrusive body present in the Serrania de Jarara. This author grouped the metamorphic rocks and coined the term Etpana Formation. In this paper, we adopt the name Etpana Metamorphic Suite (Zuluaga et al., 2008) referring to the metamorphic rocks exposedinthenorthernsectoroftheSerraniadeJararaandSerraniadeMacuiraand consisting of a large lithologic variety such as quartzite, quartz-schist, graphite schist, talc- tremolite schist and phyllite associated with blocks of serpentinites, gabbros, and blueschist. Lookwood (1965) argued that the protolith for these rocks correspond to a thick sequence of shales and quartz arenites with small quantities of tuffs, deposited in a deep basin. The Parashi Stock is an intrusive body of quartzdioritic to granodioritic composition with aplitic and dacitic associated dikes. The name Parashi Pluton was proposed by Renz (1959) and redefined by Lookwood (1965) as Parashi Quartzdiorite, who characterized the body as a mesozonal intrusion with a narrow contact metamorphic aureole in the country rock and reported a hornblende K/Ar age of 48 ± 4 Ma in a quartzdiorite sample from the pluton. This middle Eocene cooling age is confirmed by hornblende and biotite K/Ar ages in the range 45 - 47 Ma reported in Cardona et al. (2007). This pluton probably belongs to a Paleogene magmatic event recorded at the boundary between the Caribbean plate and the South American plate. For example, intrusives of tholeitic affinity, and interpreted as related to island arc tectonic setting, have been reported at the south end ofthe Caribbean plate in Venezuela, Tobago, Talamana and Virgin Islands (LidiakandJolly, 1996).Similar bodies of dioritic to granodioritic composition and Tertiary age have also been recognized in Panama, Costa Rica, Jamaica, Haití, Puerto Rico and Virgin Islands (Lidiak and Jolly, 1996). The rocks of the Etpana Metamorphic Suite were accretioned to South America and partially exhumed during Late Cretaceous - early Tertiary Caribbean plate convergence with the South American plate in a tectonic event known as the Caribbean episode (|ames, 2000). The age of the unit has been interpreted to be Late Cretaceous according to stratigraphic relations with surrounding rocks, including the intrusive episode of the Parashi Stock during the middle Eocene. The mentioned crystalline lithologies are partially covered towards the borders of the Serrania by Tertiary and Quaternary sedimentary units. West, south and east of the Serrania de Jarara, the Siamana Formation, a 430 m thick Oligocene marine sequence of very fine and fine grained, calcareous and fosiliferous sandstones, lies non-conformably over the Etpana Metamorphic Suite. Towards the north, the Uitpa Formation, an Oligocene to lower Miocene (Rollins, 1960) 150 m thick marine sequence of very fine grained sandstones locally fosilifeorus interlayered with biosparites, mudstones and siltstones, overlies partially the Siamana Formation in angular uncorfomity and partially lies non-conformable on top ofthe crystalline rocks ofthe Serrania de Jarara. Additionally, a great variety of recent deposits of different environments exist in the Alta Guajira, towards the north of the Serrania de Jarara it is common to find intramareal dark brown calcareous mud in flat horizons and alluvial fans with abundant coarse grained quartz pebbles. The Parashi Stock is located in the northernmost portion of the Serrania de Jarara. This is a small elongated intrusive of approximately 56 km2 with the long axis oriented N 45° E (Fig. 1). Lithologic varieties observed in the stock include a compositional range from tonalites to monzogranite, with enclaves of melanocratic diorites (Fig. 2), aplitic dikes (mainly towards the contact) and andesite-dacite dikes intruding the stock and the EtpanaMetamorphic Suite. A contact metamorphic aureole is observed around the pluton, in the west margin, the width of the aureole is about 50 m. A sericite-chlorite-quartz-feldsparphyllitewas metamorphosedto acoarse-grainedbiotite-quartz-oligoclase hornfels. The aureole is larger in the north and east margins (up to 75 m) where metasedimentary calcareous rocks were metamorphosed to diopside-plagioclase-calcite-garnet-quartz hornfels (Lookwood, 1965). Structurally, the pluton is characterized in map view by its high aspect ratio and by deflection of regional markers (host rock structures), this deflection is most notable in a narrow structural aureole. Other structural characteristics of the pluton are a poorly developed magmatic fabric and the presence of a few stoped blocks observed near the contact with variable dimensions form tens of meters to centimeters. Tonalite is the most common lithology in the stock; however, variations to granodiorite and monzogranite are observed locally. The most common mineral assemblage is plagioclase + quartz+hornblende + biotite with titanite, zircon, apatite and pyrite as accessoryminerals (Fig. 3). Euhedral to subhedral zoned oligoclase to andesine plagioclase (30% to 40%) and anhedral quartz (20% to 30%), in small pods, are the primary constituents of the rock. The most abundant mafic mineral is subhedral to anhedral olive green to green brown magnesio-hornblende (10% to 30%), which is often accompanied by anhedral olive green to green brown biotite (8% to 10%). Inclusions in hornblende are abundant and consist mainly of titanite, zircon and locally biotite. Hornblende and plagioclase analyses for sample GM-2IVD-58a are shown in Table 1. Diorite enclaves are observed commonly within tonalite towards the contacts of the stock. They are fine grained and composed mainly of plagioclase + hornblende + biotite ± quartz. Abundant dikes are observed intruding the stock and the Etpana Metamorphic Suite in a N-S array. Aplitic dikes occur in the boundaries of the stock as gray-pink fine-grained aplites and are composed primarily by quartz (61%) and alkali feldspar (24%) with minor plagioclase (14%). Andesite-dacite dikes have a porphyritic microstructure and contains phenocrysts of zoned plagioclase, quartz, zoned hornblende and biotite. Note that the relationship between the stock and the dikes is still unknown. This metamorphic unit consists mainly of a metasedimentary matrix with embedded mafic and ultramafic blocks. The matrix is variably composed of quartzites, mica schist, graphite schist ad tremolite schist (Fig. 2). Foliated quartzites appear like discontinuous lenses within the suite and are observed commonly folded. They are composed of quartz with minor hornblende, biotite, garnet, and plagioclase. Mica schist have a paragenesis of quartz + muscovite + biotite with minor garnet, chloritoid and plagioclase, and locally andalusite porphyroblasts cutting the Sn+1 regional metamorphic foliation (Fig. 3). Retrograde chlorite is common in quartzite and mica schist. Tremolite schist consists mainly of tremolite-actinolite + calcic clinopyroxene + talc with minor plagioclase. Porphyroblasts of tremolite are also observed crosscutting the Sn+1 metamorphic foliation (Fig. 3). Blocks of serpentinite, gabbro, and blue schist are observed throughout the unit, and eclogite blocks are suspected to be present. Serpentinite consists essentially of antigorite locally with relict pyroxene, minor magnetite, crisotile and carbonate veins. Gabbros are medium grained equigranular with cataclastic microstructure near fault zones (milonites). They are composed of plagioclase + pyroxene + amphibole + olivine + epidote. Blocks of glaucophane schist are found within serpentinite bodies and are composed of clinozoicite + glaucophane + chlorite + sodic plagioclase, minor titanite and calcite. Boulders of Eclogite and other high pressure rocks present in a Tertiary conglomerate are suspected to be originated from the suite. Quartzites and tremolite schist are the most common lithologies near the contact with the Parashi Stock and commonly appear in interlayered white and black millimetrical bands (MO-2IVD-5). Although it is possible to observe local silicification in the outcrops near the contact, the regional metamorphic foliation is still present in rocks from the contact aureole and the overprinting contact metamorphism is mainly evident in thin section. The presence of tremolite, calcic clinopyroxene and plagioclase porphyroblasts cross cutting Sn+1 regional metamorphic foliation within the tremolitic schist (samples MO-2IVD-5, Fig. 3) and porphyroblasts of andalusite also cross cutting Sn+1 in graphite-biotite schist (samples AG-2IVD-3 y MO-2IVD-15, Fig. 3) support field observations ofthe contact metamorphic aureole around the pluton. In calc-alkaline intrusives, the Al content in calcic amphibole in the presence of an appropriated buffer assemblage can be used to determine pressure of crystallization because of a linear relationship between crystallization pressure and Al content. Several calibrations use this empirical relationship to calculate emplacement pressure (e.g., Hammarstrom and Zen, 1986; Hollister et al., 1987; Johnson and Rutherford, 1989; Schmidt, 1992; Anderson and Smith, 1995). In this work, the experimental calibration of Anderson and Smith (1995) based on the previous calibrations of Schmidt (1992) andJohnson and Rutherford (1989) was chosen because it considers the temperature effect on the estimated pressure. The crystallization temperature was calculated using the Holland and Blundy (1994) hornblende-plagioclase thermometry, were stable hornblende and plagioclase coexist in calc-alkaline rocks. The hornblende-plagioclase thermometry actually consist of two reactions, the A thermometer uses the edenite-tremolite reaction (edenite + 4 quartz = tremolite + albite, in quartz rich rocks) and the B thermometer uses the edenita-richterite reaction (edenite + albite = richterite + anorthite) (Holland and Blundy, 1994). 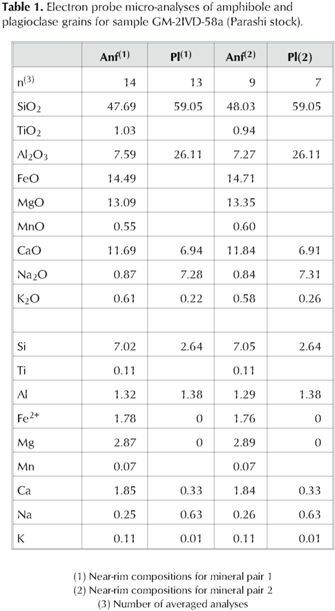 Thermometry and barometry results for two amphibole-plagioclase mineral pairs (mineral analyses shown in Table 1) using the Anderson and Smith (1995) calibration and temperatures from Holland and Blundy (1994) calibration gives a crystallization pressure of 3.1 ± 0.6 kbar with temperatures in the range 670 -692 °C. The calculated pressure (3.1 ± 0.6 kbar) indicates upper level crustal emplacement in agreement with field evidence, as microstructural observations points mostly to elastic deformation (e.g., mixtures of lithologies in the aureole and deflection of regional markers). However, viscous flow is not completely disregarded because ofthe presence ofboudinage. The emplacement process of this pluton will fit better a description of emplacement-ascent driven by buoyancy and regional stress as a viscoelastic diapir in the sense of Miller and Paterson (1999), where the rheologic behavior of the country rock varies both temporally and spatially from brittle to ductile. The form of the pluton also points to a viscoelastic diapir interpretation since diapirs tend to have high aspect ratios (Weinberg & Podladchikov, 1994) in contrast with dyke-fed intrusions that are expected to be typically sheet-like, with a low aspect ratio (e.g., McCaffrey & Petford, 1997, Cruden & McCaffrey, 2001). It must be emphasized that the conductive cooling model used here only applies to static, or motionless, magma bodies and do not consider heat transfer facilitated by fluid circulation. Nonetheless, it is useful as a valuable "base-line'' against which to evaluate thermal histories of more dynamic advective and convective systems where movement of liquids facilitates heat transfer. The cooling model attempts to estimate the highest temperature reached in the country rock at the emplacement depth. Using a pressure near the value calculated above (3 kbar) and tonalite average density of 2,8 gr/cm3, the emplacement depth for the intrusive is ca. 11 km. The assumed stock geometry for thermal modeling is that of a cylindrical body of 9 km diameter and 9 km height. Since there are not available data for the extension of the stock with depth, the height from the stock was assumed. It was also assumed that the stock was emplaced at 3 km below the surface; this implies that the shallowest part of the stock was probably in a zone with brittle to elastic deformation; however, this assumption has not implications in model results since this emplacement depth could be any value between the assumed above and the current erosion level as inferred from thermobarometry. Other model assumptions are: magma temperature of ca. 690 °C (silicic magma), magma thermal conductivity of 3.0 W/m K, magma heat capacity of 1800 J/kg K (Murase and Mcbirney, 1973; Clauser and Huenges, 1995; Waples and Waples, 2004), an initial local geothermal gradient inside the magma body of 20 °C/km, a near surface geothermal gradient of25 °C/km, a closed simple conductive cooling magmatic system, and host rock consisting ofpelitic schist with densityof2770 kg/m3, conductivity of 2.5 W/m K, and heat capacity of 1150 J/kg K (Murase andMcbirney, 1973; Clauser and Huenges, 1995; Waples andWaples, 2004). Figure 4 illustrates model states after the intrusion with pelitic country rock at 0,5 x 103,10x103,15x103,20x103 and 30 x 103years after the intrusion. In the initial stage, just after the intrusion, the magma is at an initial temperature of690 °C. Thermal evolution at 10 x 103 years from the intrusive event shows a cooling magma and an anomalous high temperature geotherm in the country rock. The temperature of the country rock increased up to 461 °C at 11 km depth and 100 m from the contact. 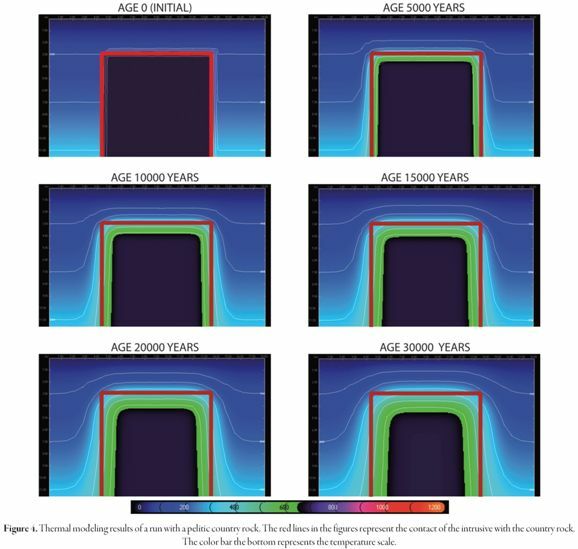 In the subsequent 20 x 103 and 30 x 103 years after the intrusion, the temperature profile in the country rock does not show significant changes. At 40 x 103 years after intrusion, the temperature ofmore than half of the magma body had decreased to less than 600 °C. In the country rock, the horizontal thermal profile show that the maximum temperature at 4 x 104 years is 467 °C, which represents the contact metamorphic peak and indicates that the temperature in the inner aureole increased beyond the peak at 3x104 years, this contact metamorphic peak last from the time the maximum temperature is reached to 8 x 104 years. More than 80% of the magma has crystallized at 10 x 104 years after the intrusion and temperature at 11 km depth in the inner aureole has dropped to 463 °C. The temperature into the country rock fell to 428 °C at 3 x 105 years after the intrusion. "When semipelitic schist and serpentinite country rocks are considered as the country rock instead of pelitic schist, the disturbance of the local geotherm behaves differently. With a semipelitic country rock, contact metamorphic peak is reached earlier than in a pelitic country rock; the maximum temperature of422 °C is reached at 2 x 104 years and this disturbance extends trough 3 x 104 years. A serpentinite country rock will reach the maximum temperature of 475 °C at 5 x 104, and the disturbance will last up to 10 x 104 years. 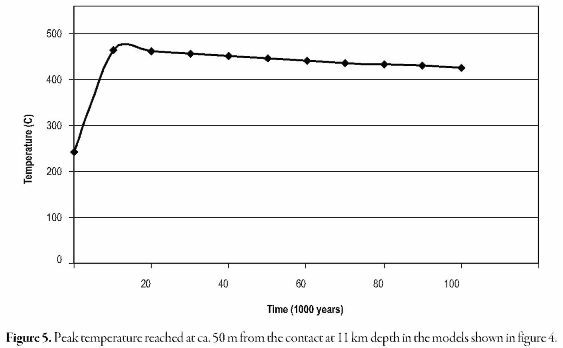 Calculated latent heat in the model shows that during the first 1 x 104 years only 35% of the magma body has crystallized; subsequently, at 5 x 104years 69% of the body has crystallized, and at 10 x 104 years 88% of the body has crystallized. This indicates that the crystallization is faster during the initial stages after emplacement, and that the complete crystallization of magma body occurs at about 12 x 104 years after intrusion. The thermal behavior in the contact aureole shows that the thermal peak is not reached at the same time in all areas around the pluton, while rocks in the inner aureole start cooling after its thermal peak those further out of the contact are still below their thermal peak. In the model, the country rock at 1 km from the stock reaches its maximum temperature (ca. 465 °C) at 1 x 104years after the intrusion; this is the thermal metamorphic peak of the contact metamorphism. Rocks 10 km away from the contact reach their maximum temperature at 15 x 104 years after the intrusion. The assemblage andalusite + biotite (sample MO-2IVD-15) occurs in a wide field at low pressure; however, the absence of cordierite restrict temperatures below the first cordierite producing reaction (Mg-chlorite + Al2SiO5 = Mg-cordierite + H2O), i.e., below 500 °C. This is in agreement with results from the thermal model of pluton emplacement where modeled temperatures in apelitichostrocks gives amaximum temperature of ca. 465 °C. Thermal modeling, following the observed geological features and with reasonable assumptions for physical and chemical magma and country rock properties, helps to understand the geologic history of intrusive - country rock system and has to be used only as an approximation to the real behavior ofthe system. Model predicts that, at a depth of11 km, temperatures above 400 °C that could produce a metamorphic contact aureole in the country rock are only reached in a narrow zone of less than 200 m around the contact and that the peak temperature is reached soon after the intrusion (ca. 465 °C at 1 x 104 years after the intrusion, see Fig. 4). This work was developed within the mapping project of the Alta Guajira region, Colombia, with funding from INGEOMINAS and Universidad Nacional de Colombia. The authors thank INGEOMINAS for their financial and logistic support during field workin the Serrania de Jarara.The Department of Geological Sciences Universidad Nacional de Colombia)allowedtheuse of petrographic microscopes and other equipment. We also thank to Dr. Harold Stowell (Department of Geological Sciences, University of Alabama) for his assistance with the acquisition ofmicroprobe analyses. The manuscript was improved following comments and suggestions from two anonymous reviewers.